D0z.me URL Shortener Facilitates DDoS Attacks ! Conceptual hacker Ben Schmidt has combined his interest in the recent spate of DDoS attacks surrounding the WikiLeaks dump as well as what he holds to be the public’s increasing over-reliance on URL shorteners and created D0z.me. 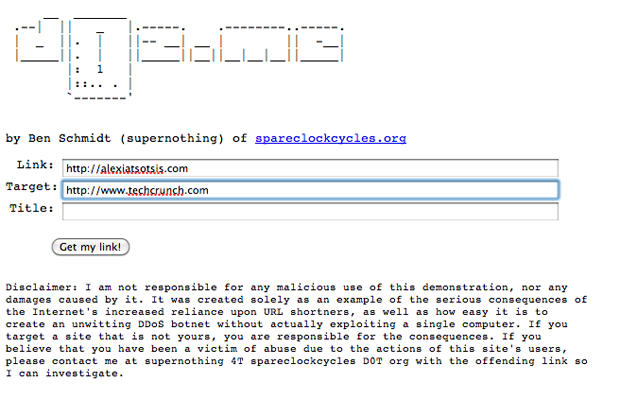 D0z.me is a “proof-of-concept” URL shortener that attacks a server while re-routing links. Attackers interested in scaling attacks would then share this text with as many people as possible with the objective of either creating content that would go popular (tricking users to share the link) or have people voluntarily involve themselves in the distributed attack by clicking on the link.